Small business CRM software to manage all your customer relations using your contacts and company knowledge. Intrabench CRM is a convenient software centre to manage your accounts, invoicing, sales and marketing. Intrabench crm software also provides full email management capabilities including client tracking and bulk email. Intrabench CRM is a fast, secure and reliable way to organise contacts, drive sales, manage productivity and keep accounts - all from your personal user-interface - simple and intuitive CRM. 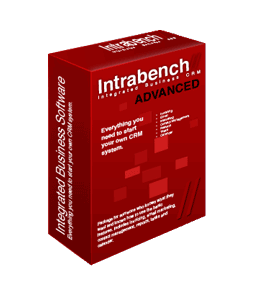 Intrabench is designed with the business in mind, each feature is created to save time and enhance your productivity. Have a look at the features and see how some of these will benefit you, from searching for clients, call back reminders, opportunity tracking, quotes and invoicing to automatically chasing payments. Intrabench offers you the entire circle of operation that no other small business crm system can offer. Try it and you'll see why so many people love it. 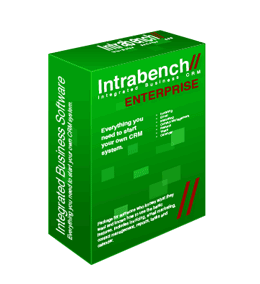 Intrabench is a complete business-management and data protection CRM software system. Versatile, fast and secure, Intrabench is the best way to organise contacts, drive sales, manage productivity and keep accounts - all from your customised user interface. Intrabench also provides full email management capabilities including client tracking and bulk email. Create surveys, text contacts and set reminders for call-backs at the click of a button. Intrabench is a hosted (online) CRM, therefore leaves you without the stress of managing any hardware, organising backups and carrying out maintenance upgrades. It's all done for you, all you need is an internet connection and a web browser such as Firefox or Internet Explorer. No time to setup a CRM system? Intrabench's small business CRM software brings the power of customer relationship management within easy reach of small and mid-size businesses. The tools allow you to consolidate customer data in a single secure database that you can access from anywhere and at any time. In-depth customer history can be maintained which enables you to provide a personalised one-to-one service. This helps to create and maintain customer loyalty, and thereby maximise customer retention. CRM can benefit virtually all departments within an organisation: including sales and support, finance, forecasting, human resources, manufacturing, R&D, and logistics. Allowing you to keep track of everything going on in your organisation. View case studies of current customers who are completely satisfied with Intrabench to see how easily Intrabench CRM can be incorporated into your business. We have clients ranging from high-end development industries, financial services and retail outlets as well as one man bands who just want to keep their affairs on track. Be quicker to follow up leads (automatically). Convert leads and track conversations made. Manage billing and accounts with ease. View reports on sales, opportunities and invoices due or overdue. Market your product and see response rates and clicks. Allow staff to work better by sharing information. Intrabench specialises in Customer Management Software that can assist any size of business. Our web based solutions provide the best answer for companies seeking to buy a wealth of usable features and information than can be easily accessed with our online web based Customer Management Software. Reporting is made simple and offers applications that many other UK Customer Management Software solutions do not come close to matching.